← Coming Friday 1/29/10: Kellblog! 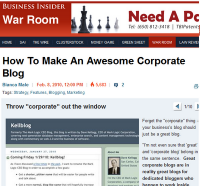 I’m happy to report that Kellblog was featured prominently in a story yesterday on Business Insider entitled How To Make An Awesome Corporate Blog. I provided the first tip: throw “corporate” out the window. That’s because,definitionally, I don’t think there are great corporate blogs. There are only great corporate bloggers. If you really want a “corporate” blog, try a “news and events” RSS feed instead. It will be less work and more directly meet the information need. If you want coverage in the blogosphere, appoint smart people to engage with existing blogs/bloggers by commenting. If you really want your message, or some aspects of it, out through blogging, then find one or more people in the organization with the skill, time, and desire to write a blog that will indirectly benefit the company. For example, Timo Elliott at SAP writes such a blog, BI Questions. I get another nice excerpt in the middle. Whatever you do, your blog should not be “an advertisement for the company or a regurgitation of company news and press releases,” Kellogg warns. The full story is here. For those really interested in corporate blogging, you should check out what Debbie Weil has to say on the subject.